Want to make life easier for investors considering a position in your company? Looking to improve access to information for existing institutions and private investors? The Bowen Craggs Index of Online Excellence, first launched in 2007, now offers new insight into what works – and what doesn’t – when it comes to online IR. Nestlé tops the index overall, followed by Bayer and Eni, with Bowen Craggs staff compiling 10,000-word reports on each company to help whittle down the world’s largest 200 firms by market cap to a top 30 list. But which firms top the list when it comes to online IR? 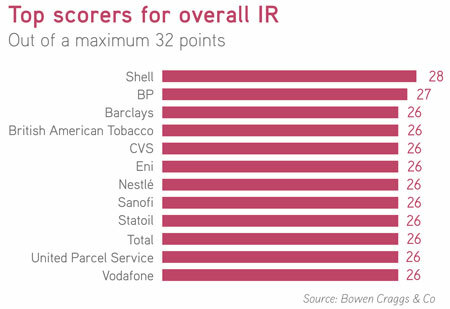 Shell takes top spot, with BP in second place and 10 companies sharing third place (see chart below), but Bowen also highlights a number of companies that cater particularly well to specific types of investors. ‘Some companies provide really detailed material for analysts or other professionals looking at the company from an investment perspective,’ he says. ‘The leaders here are Eni, Nordea and Shell. Eni offers an impressive range of background materials for analysts, including an extensive strategy section, a downloadable Excel file and a sophisticated financial and operational charting tool. Nordea also makes the top three when it comes to servicing analysts already knowledgeable about the bank. Bowen mentions Citigroup and ING, too. ‘What marks these firms out is the exceptionally clear way they present current and archived data, so professionals can very quickly find what they want,’ he says. Citigroup’s quarterly earnings, for example, are available from a single page that is ‘above the fold’. Data has longevity, too, going back as far as 2000 at Citigroup. ‘As well as standard documents, all these groups provide Excel downloads and a webcast archive,’ Bowen adds.